THM-friendly recipes, straight to your inbox. Sugar-Free Life on the Canadian Frontier. This Hearty Garden Vegetable Soup makes the most of this time of year when everything in the garden seems to be ready at the same time! A Trim Healthy Mama E meal, you can serve this soup with a slice or two of sprouted or sourdough bread for dunking. Generally, beef is not an acceptable ingredient in E meals because red meats are too high in fat for carb-based meals. However, extra lean (look for 96% or higher) that’s been rinsed in hot water (you can do this in a colander) to remove any excess fat after it’s been browned, fits within Trim Healthy Mama’s E meal guidelines. For this Hearty Garden Vegetable Soup, you can brown your meat first, rinse it, and then put it back in the pan before scramble frying it with your spices and adding the other ingredients. Since this is an E meal, you can add whatever veggie (except white potatoes) your heart desires to this soup! Zucchini, corn, tomatoes, beans, peppers, carrots, sweet potatoes, squash, onions, celery…the list is pretty much endless! If you plan on freezing this soup, leave out flowering veggies like broccoli and cauliflower until you’re ready to re-heat. They may get mushy otherwise. 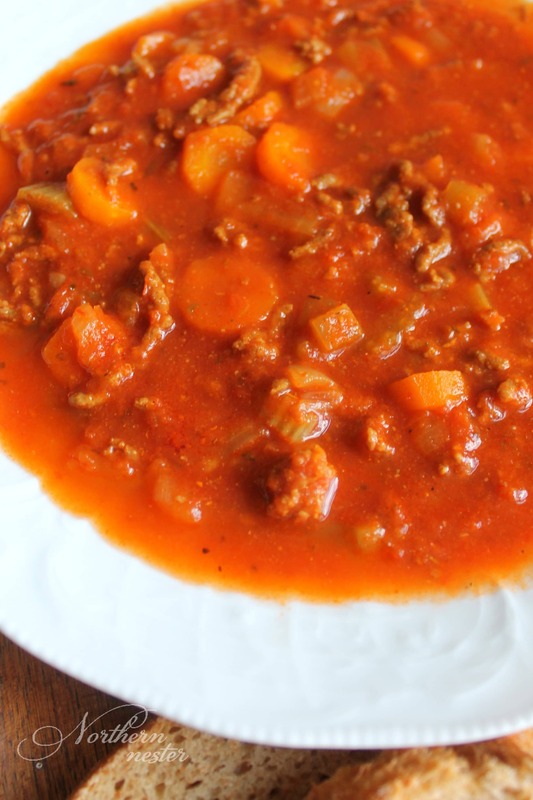 Fry extra lean ground beef in a large soup pan. Rinse under hot water in a colander to remove any excess fat. Return to pan. Add in seasonings and fry together for a few minutes. Stir in vegetables and cook, partially covered over medium-low heat until veggies are tender-crisp, stirring often. Pour in chicken broth, canned tomatoes, and bay leaves. Bring to a boil. Boil for 20 minutes. Simmer until ready to serve. Looking for more soup to use your garden veggies in? Here are some of my other favorite Trim Healthy Mama-friendly recipes! We can use lean turkey without having to rinse it right? Amazing soup! Love all your recipes. . . You’re our ‘go to’ THM blog. Glad you’re back! Hoping all goes well with this pregnancy. Congrats! Soup looks awesome. What is the bread that’s pictured with the soup? I made this soup today and it really is wonderful. It’s so filling I didn’t even need bread with it. The flavours are great. I’m Jacinda; Brad’s wife, Mom to 6, and an official Trim Healthy Mama recipe creator! You can read my personal THM testimony here. I hope you enjoy these no special ingredient, low glycemic recipes. With love, from my kitchen to yours. to receive new sugar-free recipes! Some recommended products may use affiliate links. Northernnester.com is a participant in the Amazon Services LLC Associates Program, an affiliate advertising program designed to provide a means for sites to earn advertising fees by advertising and linking to Amazon.com. Amazon and the Amazon logo are trademarks of Amazon.com, Inc or its affiliates.